Nias consists of a group of islands located on the west coast of North Sumatera, Indonesia. It covers an area of 4,771 km2 which is mostly lowland area of ± 800 m above sea level. The main island is Pulau Nias (Nias Island) located on latitude 0.21′ – 1° 32’north and longitude 97°3′ – 97°98′ east. Nias Island is called Tanö Niha or “the land of man” by Ono Niha, the natives of Nias. Ono Niha speak Li Niha with northern, central and southern varieties. Nias is divided into two regencies: Kabupaten Nias (Nias regency) in the north and Kabupaten Nias Selatan (South Nias regency) in the south. 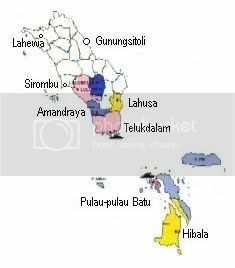 Kabupaten Nias Selatan is a new regency formed in early 2003. Nias was recently hit by three consecutive natural disasters: flood and landslides in 2001, tsunami and earthquake of 24 December 2004 and the 28 March 2005 earthquake. These tragedies – on the positive side – have helped exposed Nias to the outside world, and have since attracted aids to Nias. Following the 2004 tsunami the Indonesian government established the Agency for Reconstruction and Rehabilitation of the Aceh and Nias (BRR Aceh – Nias). The reconstruction and rehabilitation currently being carried out in Nias by the BRR and other government and non-government initiatives is hoped to advance Nias from its current and past conditions to much better ones. Nias Online aims to help expose Nias to the outside world through information on various aspects: Nias culture, language, politics, history, archives on the abovementioned recent natural disasters and the information relating to the activities of Nias reconstruction and rehabilitation. Nias Online welcomes information in the form of articles, photos and reports on activities and alike from local, national and international institutions currently taking part in the reconstruction and rehabilitation of Nias. Researchers on Nias are also welcome to contribute to this website. The English version of Nias Online was launched on 17 April 2006 and resided at: http://niasonline.net/eng/. In March 2009, it was moved to the main domain (www.niasonline.net) as a ‘Page’. If you have any ideas, comments, inputs, articles, etc. please contact us at the following e-mail address: nias.online@gmail.com or eniasonline@gmail.com. Nias Online editorial board members: E. Halawa, Etis Nehe, Ilham Mendröfa, Lovely C. Zega, Yudhykana Laia, Victor Zebua (+), Autha Zega. Batam News Contributor: Berkat Jaya Lase. Videos about Nias Online can be watched at Wasabicabe website.